They also say that the implementation of contributory social security scheme will not only allow laborers to enjoy unemployment allowance, among other benefits, but also relieve employers of the burden of employees as the latter will feel secure to leave their job or switch to other employers. The Labor Bill has already got through the parliament's International Relations and Labor Committee, while discussions on Social Security Bill are learnt to be in the last leg. Speaking at a program organized to mark International Workers' Day in Kathmandu on Monday, President of Nepal Trade Union Congress, Khilanath Dahal, said that both the laws are integrated and be endorsed together, enabling employees to participate in contributory social security scheme. 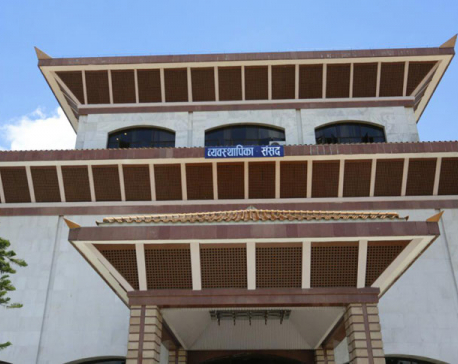 Endorsement of the two laws will improve employer-employee relations, said Pashupati Murarka, a former president of Federation of Nepalese Chamber of Commerce and Industry (FNCCI)“ "Industries can easily layoff when they have a reason to do so once the two laws come into effec”," he added. The Labor Bill has a provision that allows employer to easily layoff workforce if needed. Similarly, 'no work, no pay' provision will come into force once the bill is endorsed. Likewise, the Social Security Bill envisages providing some unemployment allowance to jobholders in case they lose job. 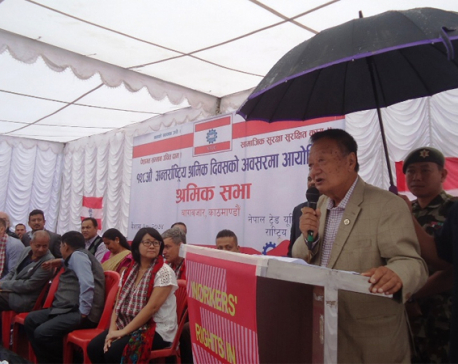 Addressing the program, Minister for Labor and Employment Suryaman Gurung said that the parliamentary committee has already forwarded the Labor Bill to the parliament, while the Social Security Bill will soon be forwarded to the house for endorsement. Workers participating in the self contributory social security scheme, according to the Social Security Bill, will get unemployment allowance for a certain period of time in case they lose job. Likewise, they also get other benefits including medical allowance for selected illness, treatment for any injury, and also maternity protection. As per the Social Security Bill, an employee will have to contribute 10 percent of his income to the provident fund and 1 percent in the social security fund, while employers have to 10 percent of the employee's salary to the provident fund and another 10 percent to the social security fund. Endorsement of the bill by the parliament paves the way for participation of all laborers, both informal and formal, in the social security scheme. Participants in the social security scheme could go above 10 million as 11.8 million people are involved in different types of jobs and works, according to Dahal. According to estimates of trade unions, only around 500,000 workers are participating in the social security fund. The fund has already collected more than Rs 13 billion.